Loose Fill Asbestos are you meeting your Obligations? In the Loose-fill asbestos insulation guide published by NSW Fair Trading a number of obligations are imposed on the industry in relation to the potential existence of asbestos in the properties that you are engaged to sell or manage. a responsibility to disclose certain matters to prospective buyers and tenants. You have an obligation under the Work Health and Safety Act 2011 to,” so far as is reasonably practicable, identify and manage the risks from loose-fill asbestos” from both a sale and property management perspective. Don’t you just love that phrase ‘reasonably practicable’? Every time NSW Fair Trading uses it we ask for an example, they are not always forthcoming. EAC has put forward to NSW Fair Trading on many occasions that as agents we are not building inspectors and we believe that in some cases too much onus is being put on agents. 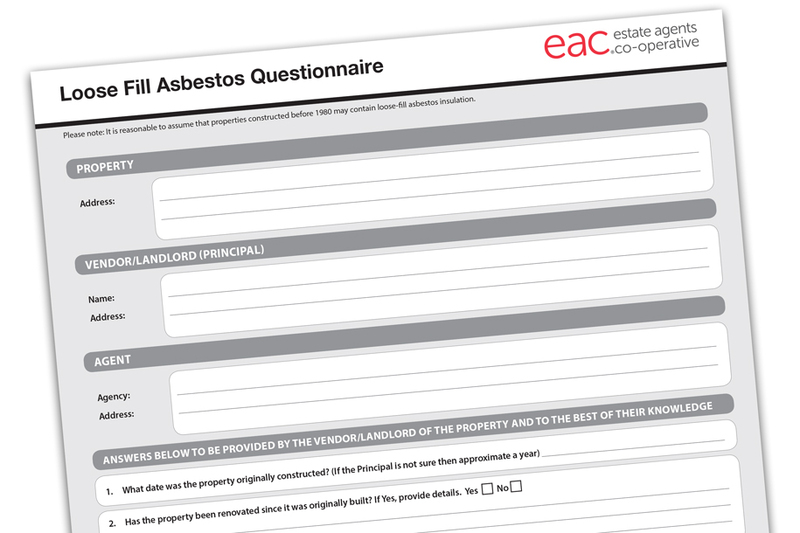 Putting that aside, to assist you in meeting your obligations in regards to Loose Fill Asbestos we have created a Loose Fill Asbestos Questionnaire. Firstly, you should be advising your principals that properties built before 1980 may contain loose-fill asbestos insulation. Secondly, you should have them complete the questionnaire at the time of your initial inspection. If you have not done this then we suggest that you send out the form to all your clients and have them complete it so you have it on file, and especially if the property was built before 1980. If as a result of the completion of the questionnaire you become aware of the presence of loose-fill asbestos or suspect that loose-fill asbestos may be present then we suggest you follow the steps outlined on the Loose-fill asbestos insulation guide. Our forms solutions provide you with the flexibility to work the way you prefer and we have made the questionnaire available both as online and printable form. The online version is now available in our Online forms solution and print version can be downloaded from our Supplementary Forms and Resources page on eac.com.au. As a reminder for Members, as part of your membership you are able to obtain free legal advice from Jemmeson & Fisher Solicitors on our agency agreements and other practice related issues. When the need arises just give us a call on 1300 137 161 and we will put you through.